When shopping for kids, especially my own kid, I like to keep to the saying " something they want, something they need, something to wear, and something to read". 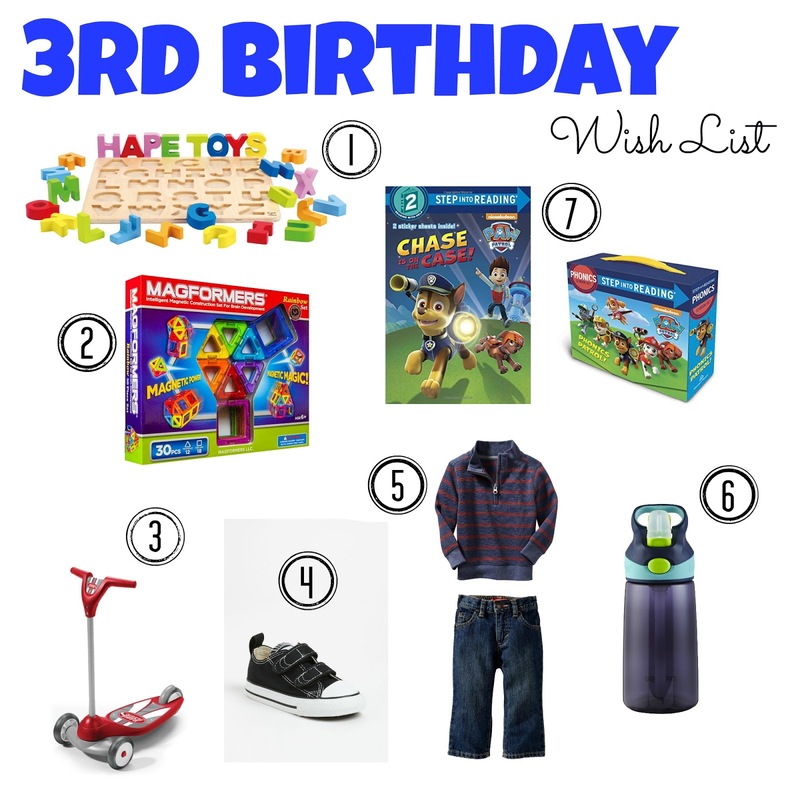 Of course I don't always get four presents for everyone so sometimes I only shop in one or two of the categories, but for Mason's birthday I plan to get him (or suggest to others to get him) things in each of the categories. So, here's what's on Mason's birthday wish list. 1 // I really want to get Mason an alphabet puzzle. I'm actually kind of embarrassed that we don't have one already because I think it would have been a big help to have to help him with his letters. I found this awesome Hape Alphabet Puzzle on Amazon that I love but I also like the Melissa and Doug upper & lower case alphabet puzzle too. I like that it has both the upper and lower case letters on the same puzzle BUT at the same time, we do have the upper and lower case magnets for our fridge, so maybe the Hape one would be better because it's different and they are actual "blocks" instead of just flat like puzzle pieces? Anybody have any experience with either or would recommend one over the other? They both have excellent reviews on Amazon so that doesn't really help either. (Hape also has this awesome lowercase alphabet puzzle as well as this numbers 1 to 20 puzzle that I would love.) He's also getting some awesome puzzles by Melissa and Doug from his Great Grandma as well (similar ). 2 // I've also heard about how awesome these Magformers are for a while now (even therapists recommend them and they come highly recommended by multiple friends), so I added them to his wish list. 3 // And then there's this -- the Radio Flyer Scooter . He's obsessed with my niece's pink one at her house and LOVES when I push him on it (did you see my video on Instagram??) so I knew he would love a scooter of his own to cruise around the neighborhood on. 4 // Ever since Mason started walking, we've been buying these Converse shoes. I think Seth would prefer to branch out and try new shoes, but I love how cute he looks in these so I win :) Nevertheless, he out grew his current pair, so he's getting 2 new pairs for his birthday. 5 // Even though it is currently 80+ degrees outside everyday, I'm starting to think about Fall clothes....well maybe Winter clothes for California since it's still pretty warm in the Fall. But, either way, sometimes the mornings are cold and sometimes I'll put Mason in a sweater with his shorts or do the opposite and send him in jeans and a t-shirt. 6 // Big boy water bottles. Mason still uses sippy cups for the majority of the time because he's kind of clumsy and likes to tip over full cups of water onto his lap while eating dinner (true story -- and he didn't even flinch even though I'm sure the water was super cold)! That being said, we still try at home (since it's easy clean up) and while he is good at drinking out of adult water bottles, I thought we should get him some of his own so I can easily toss on in my purse when we're on the go. We actually found a 3 pack at Costco but this one is similar. 7 // I'm thinking about getting this phonics box set because it has quite a few books in it and it says that each book teaches a different phonics concept to help kids learn how to read, but since it's currently pre-order only (comes out July 28th), I'm not 100% sure. I think I might wait and check out the reviews first and maybe buy it for him for Christmas. Instead, I think I may get a few single books that I know have good reviews -- like this one . Not pictured but also to note -- we also might start him in swim lessons again. The kid LOVES the pool and loves being in the pool and loves to be a daredevil on the side of the pool and jump in so I think it would be good for him to get some more swim lessons. He used to get one lesson a week but we stopped when our paid lessons ran out since it corresponded with the same time that we found out that he had fluid in his ear and we didn't know what was going on that so we put it on hold. We do have a plan now to fix that (he's getting tubes in August) and I figure if he's going to have to wear some sort of ear plugs in the bath tub, he might as well take swim lessons again too. I'm a little worried about how well he will do with the ear plugs, but that's a story for another day. Also, my sister in law found this awesome women who teaches swim lessons at her pool and specializes in kids with special needs so it would be perfect. Of course the wants are always a slightly longer list than the rest, but in all reality, I think most of the items are educational and not just frivolous toys so I'm ok with how long the list is. And also, lucky for Mason, I have some insider knowledge and think that he will be one very happy boy with what he gets for his birthday. And while I prefer the wooden block letters to the peg type, I found that having a word/picture to correspond to each letter has helped noah a lot at the beginning. I might upgrade him to the Hape one once he actually recognizes the shape of each letter. Just something to consider. We have a similar scooter and the boys love it! Our boys got some Magformers for Christmas. They are so fun! I love those converse, too. high five for velcro! Yay for the Magformers!! As a math teacher, I really do think I like them more than Brantley!! I love that water bottle! We have it. Jacob can open it on his own, yet it doesn't leak! This is preschool teacher speaking: I wouldnt stress over the alphabet puzzles, any exposure to letters is awesome and beneficial- go with the one you like the look of best and know Mason is learning with every play of it :) Happy Birthday Week!!! Great list! I've heard good things about those magformers too. Can't believe he's going to be 3! oh we have that puzzle! Aria rarely plays with it lol. I love it though, so that counts for something? She prefer her fishing type puzzles right now. But one day! Can't go wrong with Hape, I preferred the letters in that puzzle to the Melissa and Doug ones I'd seen. I've already got those magformers on Aria's wish list! Should be fun. That alphabet puzzle is awesome. I bet Mason would LOVE it! And the Paw Patrol set - oh my gosh - yes. Any and all Paw Patrol is wanted around our house these days. Can't wait to see what goodies Mason receives. And go for the lessons! I used to teach several kids with autism, and the water was always such an amazing place to get them and watch them learn and grow and simply be comfortable. I've begun to realize that Caleb is lacking in toys/materials that help highlight numbers and letters, so I've started thinking about what I need to pick up to help with that. Loving the Converse! Thanks for sharing some good ideas today! I actually have to shop for my friend's lil guy that'll be turning three as well. His birthday party is next Saturday so I better get on top of that. Ha! Carter loves magformers and magnatiles. We just got the 3 pack contigo bottles at Costco too! We have that scooter and it is awesome. Reed loves it! I'm going to look into that Paw Patrol set! Awesome list! We have a similar scooter and water bottle. Mac loves them both. And you can't go wrong with anything Paw Patrol. We're hoping to start swim lessons again soon too. Such a good list! We love paw patrol - and the alphabet puzzle!!!! Magformers are AMAZING!!!! Like seriously awesome, you'll want 2 sets :). That scooter is pretty awesome too. Love this list. So crazy to think about #3!!! Swimming lessons are such a great idea!!! And I can totally see him loving the scooter from that video! I love these lists as they help me out with what to get Ellie too!! Educational for the win!! I love that he enjoys Paw Patrol. Connor really likes them, too! We have more than our fair share of Paw Patrol goodies. These are perfect for a three year old! Mason loved his little scooter thing (#3) like that!